Yesterday I suggested that every participant matters in the preaching triangle. What happens when we leave one out? 1. God. The goal of all biblical ministry in the church is to know the God who reveals His heart in His Word. The Spirit who inspired the biblical authors also empowers the biblical communicator to point to the Son, that through Him, the Father might be known. God is at work in both the preacher and the listeners, and both need to be responsive to Him. And when we somehow leave God out? Then we have an informed presentation, or a human-level exhortation, or a religious performance for a distant deity, but we do not have Christian biblical ministry. 2. Preacher. God has chosen to use inadequate communicators to enable others to hear His Word and respond. We also form a connection with the listeners (either good or bad) and communicate with our lives as well as with our words. 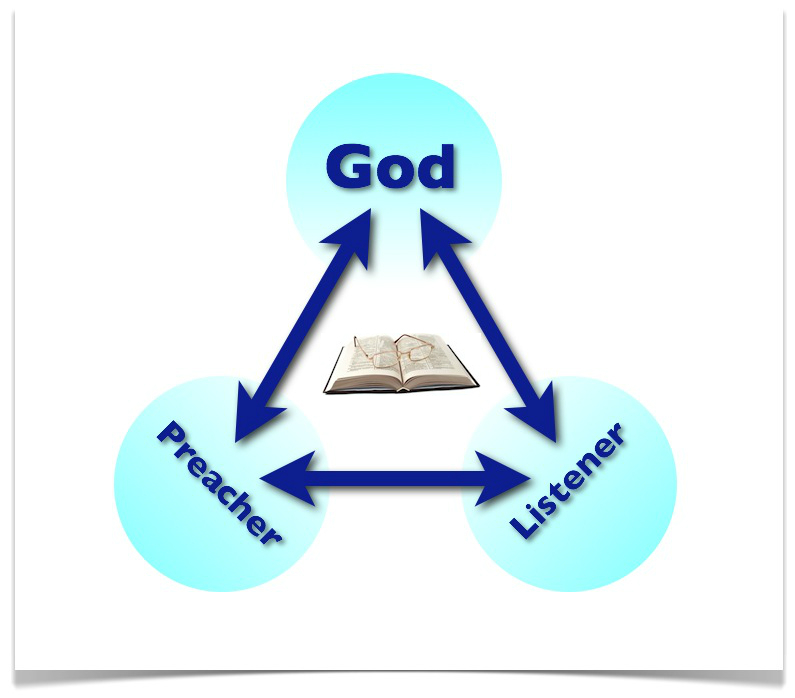 Effective communication involves the heart to heart connection of the preacher with the listener, as well as both with God. This means that as well as the verbal content (the words), the preacher must also effectively communicate by means of the vocal and visual elements (use of voice, plus posture, gesture, expression and movement). And when we downplay the role of the preacher? Then we lose the incarnational nature of God’s self-revelation, we lose the privilege of hearing God’s Word spoken with power. We might be able to affirm a strange view of “reliance on God” (based on a hope that He might work around us and despite us), but we do not have incarnational or effective Christian biblical ministry. Why would someone leave out either of these participants in their approach to preaching? I suppose a view that God is distant and disconnected, or excessive confidence in one’s own intellectual ability might lead to the first omission. A highly “spiritual” view of God’s work despite the preacher, combined with a potentially confused view of humility might lead to the second omission. Like, like, like! I call it the three P’s. People, people, people. The preacher is to tell the story of God engaging with the people of the Bible, and integrating it into the lives of the communal congregation. This means the preacher has to share the story of God working in the past in a way that draws the present congregation into God’s plans and purposes for the now. Three-fold like to your comment too, thanks Craig!